Vanitha Global Placements is a professionals' placement consulting organization, Recognised and Approved by the Ministry of Overseas Indian Affairs Government of India, according to the process of International Standards Organisation (ISO) Certification. Its corporate head office was established by Janardhan in Visakhapatnam, Andhra Pradesh, India to facilitate knowledge and human resource solutions to skilled technical professionals and also maintains its associate offices in all major cities in India. VGP has a strong backbone of professional and expertise network around the world. VGP is committed to provide the best and competent manpower resources at any time and location. VGP has its pride of clean and good track record of 15 plus years in recruitment and training industry. 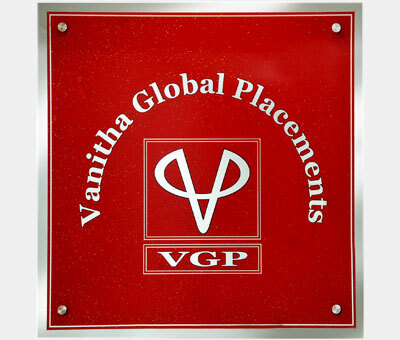 Vanitha Global Placements works for several prestigious International reputed Companies, industries and organizations. VGP understands the clients' requirements and trace and track the best manpower in India, Middle East, United States of America (U.S.A), United Kingdom (UK), Singapore & other parts of the Globe. VGP follows International Standards and well defined procedures in Selection, Training, and Service Personnel at all positions of Lower, Middle and Senior levels.